I lived in the same house and neighborhood until I left for college, and at that point you’re entering with a whole class in the same position as you. I never moved until then, or changed schools or districts. I remember calling a student who had just entered one of my elementary school classes “the new kid,” but I never knew how that must have felt. I never knew until I became the Resource Contact in the North Fayette Valley Community School District. I heard one of the students the other day say, “I just went in there and I didn’t cry or anything,” and I felt like I could relate to him really well. It’s not easy trying to tell and explain your story, make your presence known in the school, or create and develop relationships. I knew I had a lot to work on, and I had high expectations for my myself during this year of service. My service started with countless introductions, explanations, and questions. It has been close to two months since the start, and I’ve already found people to eat lunch with. Now I can go into the cafeteria and find 2nd graders to share my vegetables with, I hear my name from all directions when walking in the halls, and teachers are asking me to come in and combine food and nutrition lessons into their curriculum. As service members we start really getting into our work in October, which is National Farm to School Month. We’re two-thirds of the way through this local food celebration, and this past Wednesday confirmed that all the coordination and collaboration with NFV Food Service and my cafeteria champion Carol Stanbrough was coming along well. 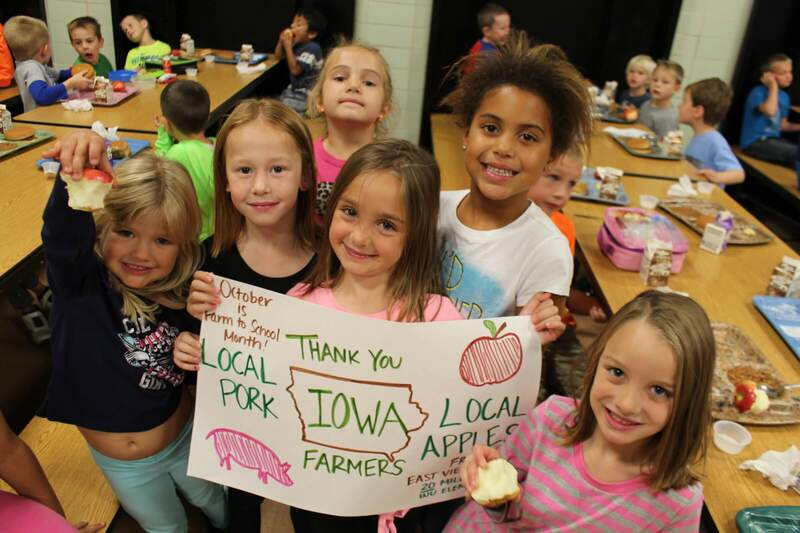 She ordered from the Iowa Food Hub and served local pork and local apples from East View Orchard in Fredericksburg, Iowa, only 20 minutes away from West Union! This picture makes me smile so big every time I look at it. In the position I’m in, the goals you’re working toward take time and it’s hard to gauge your progress. Serving local food on the school menu this month and helping to promote those efforts gave me a sense of accomplishment. It was nice to feel like the kids wanted me there and were starting to learn my name. They had tons of fun learning about the journey of their food from farm to tray! I still consider myself a kid most days, being the youngest Resource Contact and having clear memories of the tough decisions made in high school. I’m learning and growing everyday that I spend in the NFV schools, and I’ve already been labeled as the “vegetable girl.” I have big plans in the district for the school gardens, to increase food and nutrition lessons, and staff involvement, but one of my personal goals is to become part of the community, to get rid of that “new kid” feeling by the end of the year. The new kid in NFV makes amazing F2S signs! So proud of you sister!!! Great job Maria!! I agree with Molly, beautiful signs!